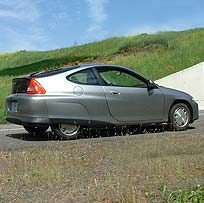 Where Should You Buy Replacement Honda Insight batteries? Owning a Honda Insight hybrid certainly has its advantages, particularly in savings at the pump. But if your Insight hybrid is getting close to the 100,000-mile mark, your hybrid’s performance is probably starting to decrease due to its aging battery. So, where is the best place to purchase replacement Honda Insight batteries? Your first thought may be to contact your local Honda dealership. This can certainly snag you a replacement battery, but you may be surprised to know there are a few cautions to keep in mind before pulling into your dealer’s service bay. For example, you may be surprised to learn that more dealerships than aftermarket professionals use refurbished or remanufactured batteries. In addition, it is obvious that hybrid vehicles differ from their conventional cousins, but how much thought have you given to these differences when choosing someone to work on your vehicle? If you have assumed that taking your vehicle to a dealership will assure you that a professional mechanic trained on the intricate workings of hybrids will be servicing your vehicle, think again. Unless your dealership can provide proof that its mechanics have specialized training in areas such as installing hybrid batteries, you may not be giving your vehicle the professional attention it requires. Just because a dealership has hybrid vehicles on its showroom floor is no guarantee its service department is tuned into the special needs of your car. Before going this route, compare prices, quality and expertise with other options. Replacement batteries do not come cheap. But if you’ve been tempted to cut your costs by purchasing a hybrid battery for your Insight from an auto parts site, online classified page or even an auction website, you could be opening up your vehicle investment to a host of problems and end up spending more than necessary. For example, what warranties are available for a battery purchased in this manner? Also, ask yourself if the battery’s quality is guaranteed. Finally, how will you install the battery? Even if you believe you know a thing or two about auto repair, your Insight hybrid is not like a conventional vehicle. Your safety and the performance of your vehicle are put into great jeopardy unless you happen to be a mechanic yourself who has received professional training to work on hybrids. When considering all the money you plan to save by purchasing a battery directly, remember to factor in the cost of installation–and the likelihood you will easily find a qualified technician to do the install. In replacing your battery, the goal should be to receive a quality product that is installed by professionals at a reasonable cost. With limited knowledge in hybrid vehicle maintenance yourself, it can be difficult to ensure all these objectives are met. Your best bet is to choose an aftermarket professional that specializes in your particular vehicle. For example, Bumblebee Batteries is completely focused on providing new hybrid system batteries for first generation Honda Insight and Honda Civic hybrids. Key to finding the right aftermarket specialist is in looking for one that guarantees its batteries are built using only new–never used or refurbished–cells that are manufactured to the highest quality standards. For example, Bumblebee Batteries cell are manufactured using the latest available fully automated nickel metal hydride manufacturing equipment. What this means is that you will receive cells that enable your battery to have higher capacity and extended service, while improving the performance of your Insight hybrid. You will also want to choose an aftermarket supplier that guarantees their product with warranty. Be sure the company is willing to provide written documentation explaining your warranty and any exclusions. There are a number of aftermarket suppliers in the marketplace, but if you identify your options based on their written guarantee that you are receiving brand new cells for your battery and a warranty, the job of finding the right supplier becomes much easier. You may have felt uneasy about the task of finding a replacement battery for your Honda Insight hybrid. However, following the guidelines above can make the job much easier, ensuring your Insight will continue to perform well for many years to come.